According to a report recently published in the New England Journal of Medicine, a Colombian man developed tumors that were actually caused by cancer cells from a tapeworm living inside of him. It took nearly three years for a research team at the Centers for Disease Control and Prevention (CDC) to discover that the man’s cancer-like tumors had originally developed as cancer cells within a tapeworm, Hymenolepis nana (H. nana). In 2014, doctors in Columbia found unusual tumor cells in the lymph nodes and lungs of a 41-year-old HIV-positive patient. They were unable to make sense of the biopsies. The cells appeared to be cancerous, but not a type they have ever seen before. Like most cancer cells, these cells multiplied quickly and were crammed into a small space. However, each cell was 10 times smaller than a normal cancer cell. Some were also fused together, which is rare for human cells. Upon discovery, the research team sent samples of the tumor to the CDC for further analysis. Researchers at the CDC’s Infectious Diseases Pathology Branch (IDPB) set out to discover the origin of these cellular oddities. They were able to track the DNA down to H. nana. Unfortunately, the patient passed away 72 hours later. 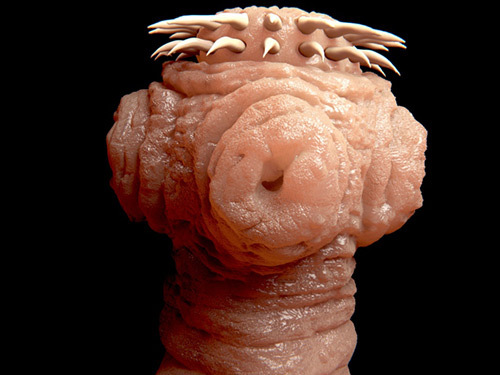 H. nana, also known as dwarf tapeworms, can measure up to 40 millimeters long and one millimeter wide. It is a common tapeworm that affects humans and is found in regions where clean water and sanitation are not easily accessible. The tapeworm will enter its human host through food infected by insects, droppings, or by accidently ingesting the feces of an infected person. H. nana is considered an effective parasite because it is the only known tapeworm that can complete its whole lifecycle within the small intestine of a human. Its ability to grow, breed, and replicate inside a human host can adversely affect a patient with a compromised immune system. Without faculties to fight the parasite, a large number can thrive in the guts of the infected host. To date, about 75 million people are infected by H. nana, but in many cases, human hosts won’t even know that they are infected. In more extreme cases, symptoms can become more prominent, including headaches, diarrhea, anorexia, and abdominal pain. Researchers believe that this tumor transfer will likely only occur in those with compromised immune systems, but due to the presence of H. nana in countries with a large HIV population, it deserves more research. Newman, T., “Mysterious cancer spreads from tapeworm to human,” Medical News Today web site; November 5, 2015; http://www.medicalnewstoday.com/articles/301934.php.